well motivated, self disciplined individuals who have a strong sense of right and wrong as well as a true concern for others. 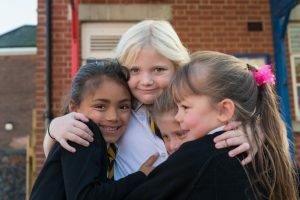 As an inclusive school we welcome children of any faith believing their attendance will enhance the already varied cultural diversity within our Christian community. 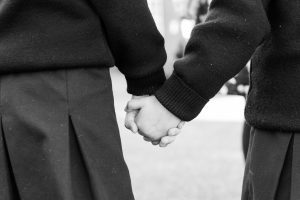 At St Nicholas Priory Primary we feel that RE is the most eternally relevant subject, because it focuses on questions that humans have asked each other and themselves for as long as there’s been language, and those questions are never going to go away. 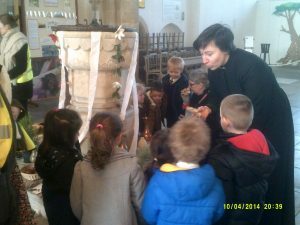 We therefore believe it is of vital importance to enable the children of St Nicholas Priory Primary to fully engage with a sense of shared experience of all aspects of religious faith. Giving our children the opportunity to become RE Ambassadors affords them the means to be challenged and pushed to do things beyond their expectations, gaining new skills and interests in the process. This experience enables them to feel noticed, develop leadership skills and become role models for others. Our RE Ambassadors take on this role on behalf of the school and in doing so they develop a greater ability to work as a member of a team whilst involving others beyond their team, breaking down boundaries of age and ability. At St Nicholas Priory Primary, we value pupil voice and electing children to serve as RE Ambassadors ensures they experience a sense of purpose and motivation, along with the confidence that their voices will be heard. The school’s RE Ambassadors are involved in a number of projects and activities throughout the school and the wider community, such as making improvements to the quality of RE teaching within school, investigating what the point of RE is, conducting surveys on people’s experiences of religious belief and looking at the relevance of RE today. The RE Ambassadors are also directly involved with how Collective Worship is delivered at St Nicholas Priory Primary, hosting their own Collective Worship service once every half term.